The Waynesboro Kiwanis Club made a donation of $500 to the United Way of Greater Augusta for the Dolly Parton Imagination Library. The local United Way, through the Dolly Parton Imagination Library, is sending books to 434 children in the Staunton, Waynesboro and Augusta County area this year. The cost is $30, per child, per year. Due to financial restraints, the United Way currently has 52 local children on a waiting list, and the current wait time for a child to be enrolled in the program is 6-8 months. 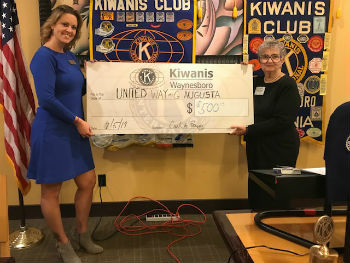 The money from the Waynesboro Kiwanis Club will allow the United Way to remove 17 children from the waiting list, allowing them to begin receiving their books as soon as possible. The Dolly Parton Imagination Library was founded in 1995 by Dolly Parton, in her home county in east Tennessee. By mailing high quality, age-appropriate books directly to their homes, Parton wanted children to be excited about books and to feel the magic that books can create. The Imagination Library became so popular that in 2000 she announced that she would make the program available for replication to any community that was willing to partner with her to support it locally. In 2009, United Way of Greater Augusta partnered with the Dolly Parton Imagination Library to bring the program to the Greater Augusta area. Since its local launch, the library has been able to help over 2,600 local kids receive free monthly books.